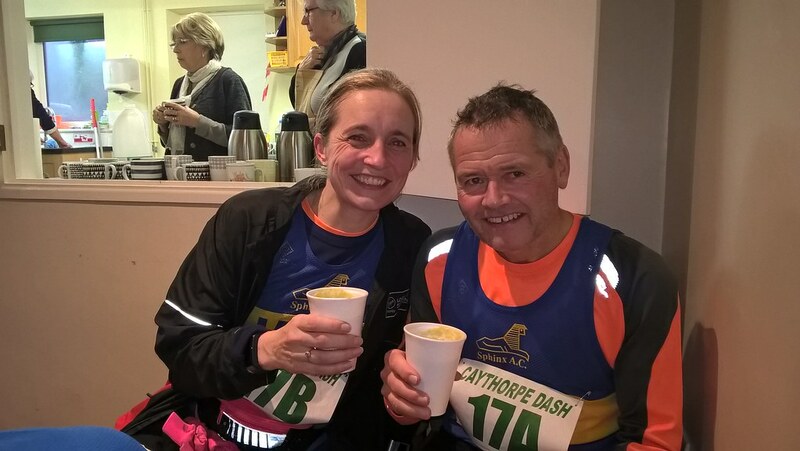 Four of us (Andy Mac, Eggman, Jax and me) made the 70 mile trip to the village of Caythorpe in Lincolnshire for an ‘off-road’ half-marathon over the ‘flat’ countryside. An awful day for running with temperatures around 2 degrees, constant drizzle and a bitterly cold easterly wind, from which there was very little protection as we crossed the open fields. The course itself had everything, tracks and trails through copses, ploughed muddy fields, stiles, kissing gates, a stretch right through a church graveyard and probably 3 miles or so on road. We also encountered possibly the only hill in the whole of Lincolnshire, from the top of which we could just about see the Eiffel Tower in the distance! We were encouraged to enter as a team at £10 a head, 2 males and 2 females, with the luscious Steve Colbourne passing as the second woman in our quartet! The entire event was organised by the villagers for the villagers with the locals providing the marshalls and preparing the food at the end with all proceeds going to Caythorpe itself . This was the ‘Winter Woodhouse Eaves’ with a veritable feast at the end – homemade soup (three choices), loads of sandwiches, and, for dessert, a choice of homemade apple pie or jam sponge, both with custard (with no limits, so a certain farmer took full advantage!) and free tea and coffee for all. Pity about the weather and conditions, but still an excellent event.